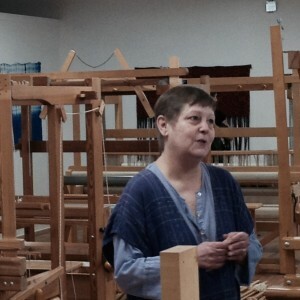 For the Praxis Fiber Workshop Open House in early June of 2015, Darcy and I went together. The youth and enthusiasm of their artistic souls is revitalizing an area once abandoned and mourned as dead. We shared the mature feeling that it is always better to explore new vistas and questionable neighborhoods with a buddy. It turned out that the only thing we had to fear were the road craters that created challenging conditions between here and there. We parked on the street with no troubles. There was a little fanfare. A few bright balloons marked the location, and live music spilled out the front door. 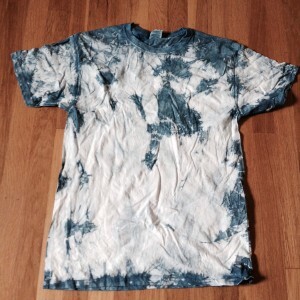 We walked past people scattered on the sidewalk and the front stoop carefully unwrapping indigo tie dye t-shirts. Just inside the front window, a man played guitar on the left side of the stage while a woman played a 4-harness jack loom to the right. The entry quickly opened into a comfortable gallery space with a TAA show presenting a wide range of fiber talents. I made sure to absorb and enjoy the offerings of so talented a group, but people I recognized kept assuring me that I really had to go out back. I was determined to explore in a leisurely and logical fashion, but I promised them that I would get there. I passed through the door into the middle space. To the left was a shiny spacious dye zone with everything one could covet in equipment. A crowd gathered in an orderly fashion to wait or work on their own free artisan t-shirt created from their own creative hands. The dye demo of tie-dye indigo produced crowd fulls of the same color shirts; all unique and individual in their design. 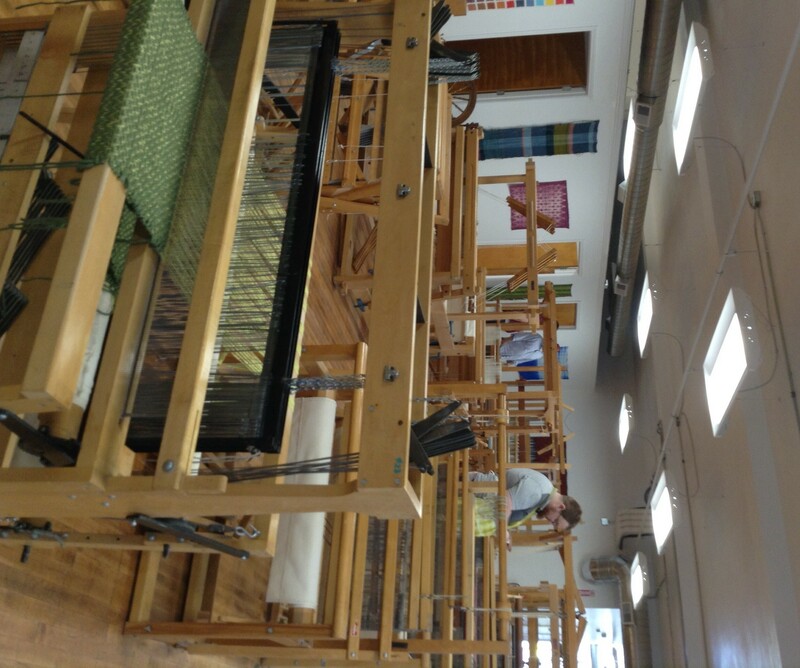 Not being much of a t-shirt person, my gaze was drawn right and captured by a very large room filled with mostly large looms. Countermarches formerly used at CIA line up like an army waiting to ride into the next wave of discovery. A small zone of jack looms is tucked in toward the back. 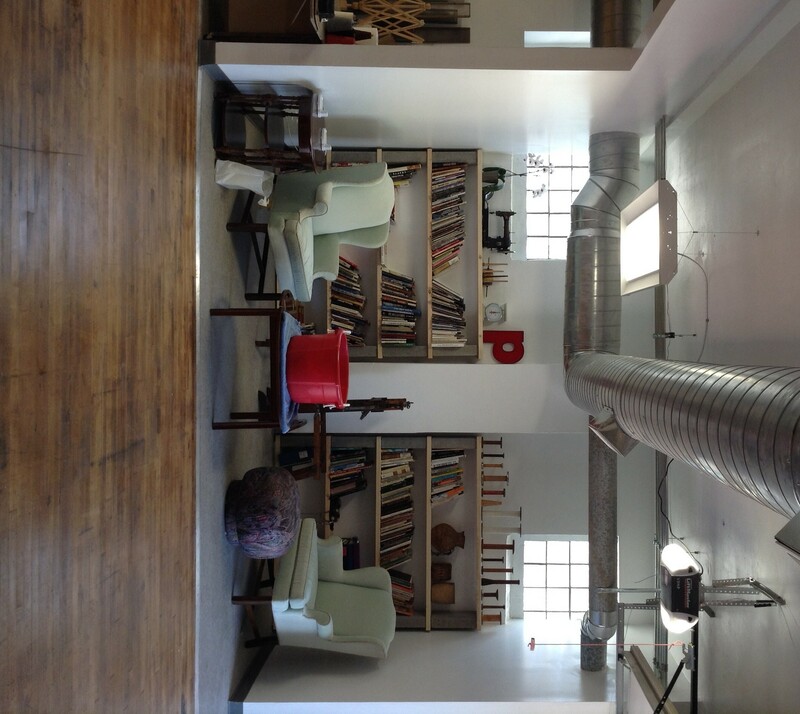 There are large empty rooms on the far side suitable and available for private studio rental. 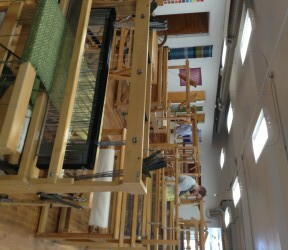 The emptiness and openness quickly became foreign and uncomfortable, so I moved back to the main area and rejoiced in the joy of seeing so many looms in one place without being at my own home. I passed equipment storage and a cozy library nook before heading out back as suggested. 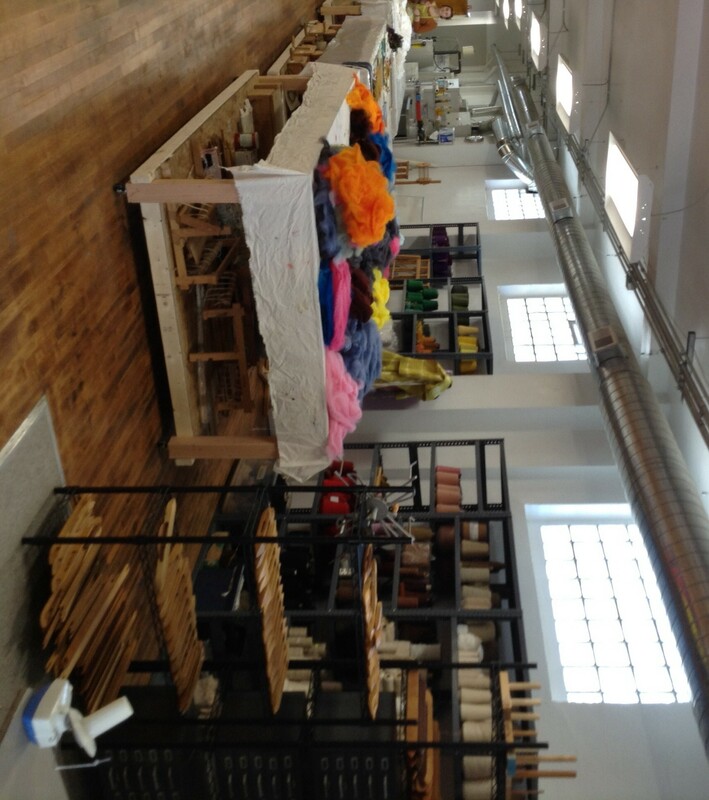 They had opened the overhead door into the back lot to allow easy access to the large felted creation growing over a large blue tarp spread out over the ground. It was pure art in both its form and function. 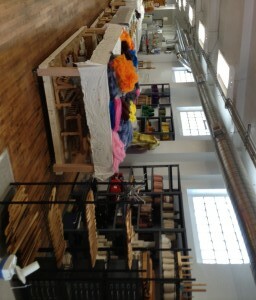 The process started with a table piled high with many colors of wool roving. Some attempt had been made to separate and sort the colors, but the choices were numerous enough to force some overlap in the piles. A bright blue caught my eye. I pulled off a healthy hand full from the sliver and started to stretch and thin it. When I was satisfied with its diaphanous nature, I slipped off my shoes, choose a spot and placed my bit of blue. I added a squirt of soap and started to introduce the sudsy fibers into the work with my bare feet. Many others were dancing over the wet and wooly bits to coerce it all into one cohesive cloth. I was happy to add my bit of color to their opening endeavor. I left with a smile and exceptionally clean toes. Classes are available to satisfy all the stages of a fiber-focused education. Those big open rooms are available for private rental, as is the dye zone. The staff is young, enthusiastic, and obviously competent. They are friendly, warm, welcoming, and well trained. We will arrange a tour for our group, but it is located close by and worth a visit anytime. With the range of classes they are offering, you might not want to wait. Check out their website here. Watch the Newsletter for the 2015-16 Program Schedule for the January 21 tour of Praxis with lunch afterwards.